The latest way to trim your waist and tone your abs is to take a class on a floating gym mat. There is a moment when, straddled across a gigantic exercise mat floating in a swimming pool, I feel as though I might be getting the hang of this new fad, Floatfit. I am at least staying upright and managing to float my mat sufficiently well to perform some of the moves being shouted by our poolside instructor. It doesn’t last. Within seconds I am overboard. If you thought pools were just for swimming and the occasional aqua aerobics class full of bobbing grey heads, think again. 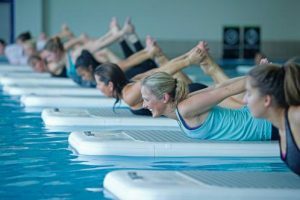 Water-based workouts are becoming more popular, from aqua spinning to weightlifting underwater, and this floating circuit class, performed on bespoke “aquabase” platforms about the size of a kitchen table, is the latest. 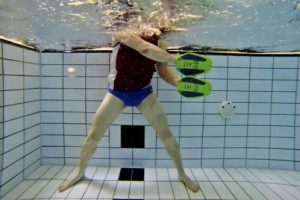 The workout is the brainchild of Tom Whelan, a former semi-professional rugby player, and Leila Francis Coleman, a former management consultant who had been trying to find an aqua class that offered more variety than paddleboard yoga. After two years of work on prototype boards and sample sessions, they came up with the format for Floatfit. There are three workouts: high-intensity interval training (HIIT), yoga and Pilates. “I was inspired by trying paddleboard yoga,” Francis Coleman says. addleboard exercise became popular because it works the core — you engage it to balance and remain upright. Unlike Floatfit, though, it is purely yoga moves performed on traditional, narrower paddleboards. With Floatfit you do a range of workouts but every movement works the core as you endeavour to stay upright. Classes run at nearly 20 venues in the UK. The one I’m doing at the Worthing David Lloyd Club is expected to be rolled out across each of the chain’s gyms with pools next year. I can see the appeal. Swimsuits are not required so no one feels self-conscious — gym kit with bare feet is fine. She doesn’t make it easy. At times she tells each class member to rock their boards vigorously while their neighbour attempts to complete 30 seconds of mountain climbers (where you get into the press-up position, then bring one leg to your chest, then the other), press-ups or side planks. Inevitably, this leads to more than one man (and this woman) overboard.